Mayo Day is a day dedicated to the celebration of the arts and culture, vibrant communities, and unquenchable spirit of county Mayo. Now in its fourth year, Mayo Day has garnered international success and recognition as a highly anticipated yearly celebration. Have you a daughter/son, family member/close friend living or working overseas? Why not join us in Ballina for a special celebration of Mass for all our Mayo exiles in St. Muredach’s Cathedral, Ballina at 7.30pm on Sat. May 5th (Mayo Day). Wear your Mayo colours and invite your nearest and dearest oversees to join in and watch the celebration with a live broadcast of the mass via the Cathedral webcam. http://ballinaparish.org/old_files/webcam.html. We also invite you to send in your name and message and your special request will be brought to the altar during the Offertory Procession. Your name and message may be read out during the mass. Send your name and messages to brehan10@gmail.com. 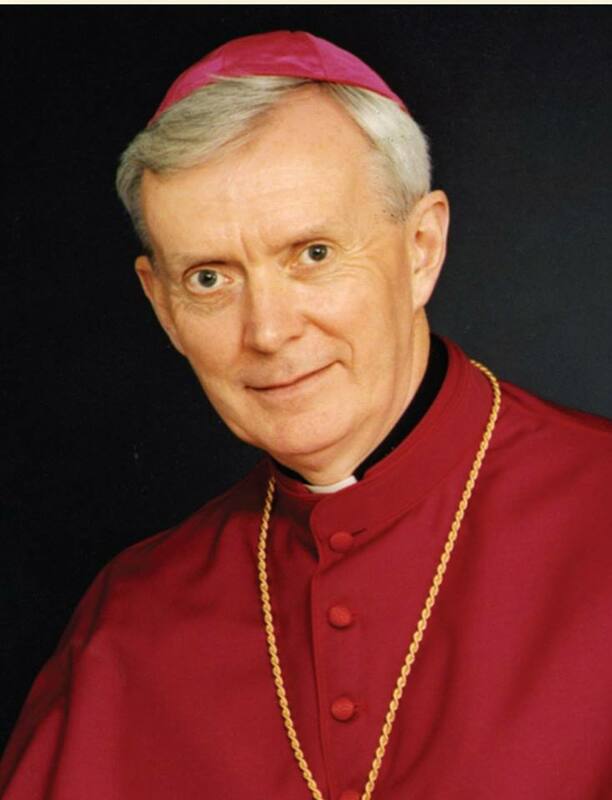 Chief Celebrant for the Mayo Diaspora Mass is Bishop John Fleming. This special mass celebrating Mayo Day will be followed by a ‘cuppa’ afterwards in The Newman Institute as the County Mayo Foundation launches its St. Muredach’s Cathedral Restoration Appeal. 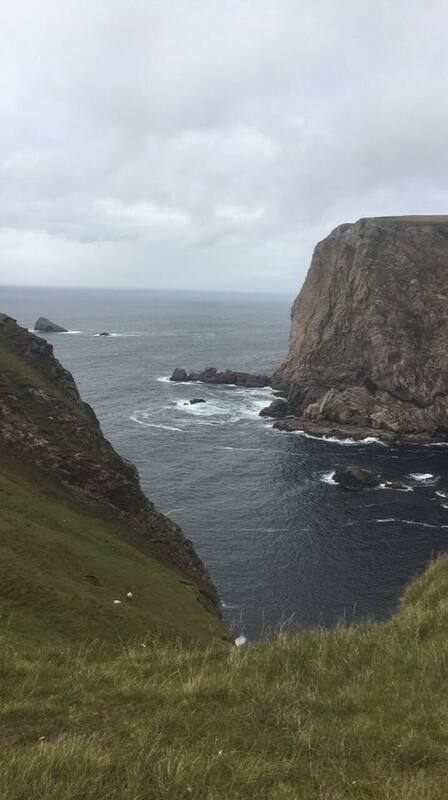 Take on a hike over some of the most scenic views that Erris, North Mayo has to offer and don your finest Green and Red colours, this Mayo day on 5th May. This unforgettable journey starts at Rossport in Dennys Bar and convenience store and using this as a base, you will be bussed on the starting leg of the journey, enjoying the later leg of the journey on foot. The Stags of Broadhaven are located 3km off Erris Head and are approximately 1.6 million years old. They consist of four rocky shaped islands which rise to over 70 metres off sea level. At the end of the loop walk you will be picked up at the base of Benwee. Here you will see the Children of Lir monument at An Priosún (The Prison). Legend has it that the children were condemned to be swans for 900 years and for 300 of these years they spent on the North Mayo Island at Inishglora. The Priosún also has significance to the area where thousands of people emigrated in the past to all corners of the world, never to return but to always carry a piece of home with them. 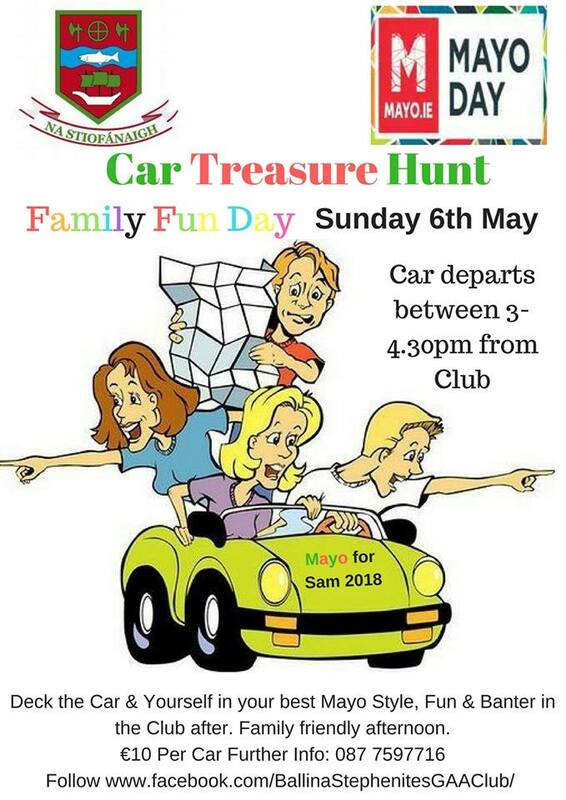 As Mayo day weekend approaches – Why not nail your true colours to the steering wheel and get your team kitted out in the vibrant Green and Red of Mayo and head out on the highways and byways of our beloved County in search of clues on a specially designed Car Treasure Hunt Mayo Style! Hosted by Ballina Stephenites GAA Club all are invited along for a fun filled family friendly afternoon. Cars can depart any time between 3 and 4:30pm on Sunday afternoon May 6th at a fee of €10 per team – So get the thinking caps on and come up with a suitable Team Name for the occasion – fun and banter on return with some food and goodies and a few ‘jibes’ thrown in too. For more info call 087 7597716 ‘MAIGHEO GO DEO’ ! Join us for our final weekend long Mayo Day 2018 celebrations with a leisurely walk along the ‘Bridges of Ballina’ accompanied by a very rare appearance of the World’s Largest Mayo Flag. The 5th Mayo Scouts (Ballina) will lead the Mayo Day Flag parade around the bridges of the World famous River Moy. Meet at McGowans, Bank Holiday Monday 7th May at 10am, and join us as we celebrate all things great about our County; take in the most iconic images of our wonderful town and be united as a great Community. Don your Green and Red, put on your Mayo Tops and show your support as Proud Mayo people.